Each frame is 0.01 seconds apart. 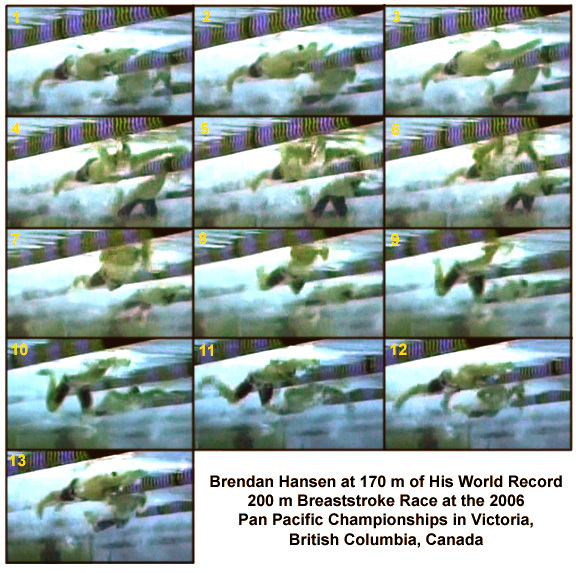 Brendan Hansen's time for this event was 2:08.50, a new world record. Frame #1: The swimmer exhibits excellent streamline. The upper arms clasp the head as they stretch forward in perfect alignment with the rest of the body. Only the feet are not aligned. Of particular note, is the small amount of turbulence coming off the face. The swimmer looks almost directly at the bottom, a position that contrasts with many age-group breaststrokers who tend to always look forward. The rounder head top allows water to escape in better streams than occurs when the face is oriented forward. Frame #4: The arms are repositioned rapidly to begin to generate propulsion. The elbows bend and the upper arms begin abduction. The forces created are not directly horizontal. There are two components to the applied resultant force. The vertical component supports the rise of the head and shoulders, which in turn allows the hips and legs to trail in horizontal streamline. The horizontal force component propels the swimmer. Frame #5: The arm forces rise dramatically. The abduction of the upper arms provides the power for the action and the positioning of the forearms and hands direct the components of the forces. The head continues to rise and hyperextension of the upper spine allows the shoulders to rise (whose undersurface creates added drag turbulence) while the remainder of the swimmer continues in streamline. What is of note here is that force application is largely backward. There is no "outsweep-insweep" pattern of movement in this action. That is an outmoded concept for swimming effective breaststroke. Frame #7: The elbows abduct completely to the sides and the hands sweep in and upward. It is possible the upward action is unnecessary. The continued streamlining of the unproductive parts of the swimmer (e.g., hips and legs) is very notable. Frame #8: The hands begin to recover forward and break the water surface slightly. [As indicated above, this could be an unnecessary exaggerated vertical movement.] The legs begin to be drawn up. Frame #9: This frame depicts a feature that is commonly seen in today's world-best breaststrokers. As soon as arm propulsion is complete, the swimmer attempts to recover forward, and have the head and shoulders returned to horizontal before force from the leg-kick is developed. Brendan Hansen is a big man, and so his larger action will take longer than a smaller person, such as Leisel Jones. However, the swimmer's arms are extending forward and his head and shoulders are being lowered rapidly. The legs have been drawn up very quickly (possibly using the stretch-reflex to its fullest advantage), but the feet have not been positioned for the kick. Frame #10: The feet are positioned ready to kick. The rapid repositioning of the head, shoulders, and arms into a streamlined forward alignment has continued. Of particular note, is the lowering of the head to be between the upper arms. Frame #11: By the time the legs are half-way through the kick the shoulders, arms, and torso are in horizontal alignment. That minimizes the frontal resistance caused by these now unproductive body parts and allows the swimmer to gain the greatest benefit possible from the kick. The swimmer has done well not to dive deeper in the water because of returning the head and shoulders and arms back into the water on the recovery. Frame #12: The width of the feet at the end of the kick indicates that the kicking legs went straight backward, ostensibly to produce the greatest forward thrust possible. That movement contrasts to the concept of the breaststroke kicking sweeping out and in, an action often taught to beginning breaststrokers. The movement in the out and in action of a sweeping kick stresses the knees unnecessarily. The direct kick of today's champions "saves" their knees and produces a more effective kick. The swimmer is in perfect streamline. Frame #13: A position similar to that displayed in Frame #1 is attained. Brendan Hansen's attention to streamline detail is a characteristic of the top breaststrokers, and could account for breaststroke being the stroke whose world-record is broken more frequently than any other stroke at this time.